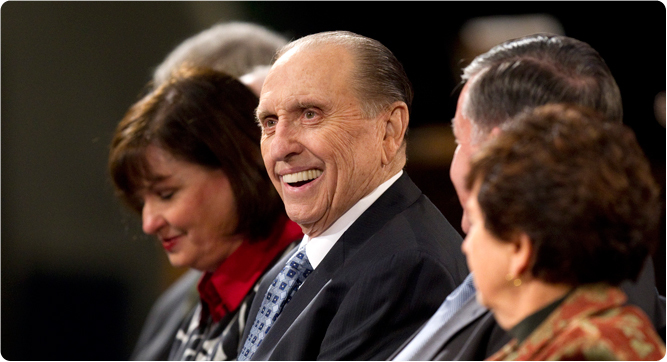 Sharing how a world-renowned Harvard scholar gained his own testimony, President Thomas S. Monson encouraged BYU students to be lights to the world in his November devotional. Watch highlights. A new BYU study says grandparents can help kids be kinder and, in some cases, smarter. Grandparents give good advice too, as BYU students share in this video. After singing its way to fame on NBC's The Sing-Off, BYU's Vocal Point finished in the competition's top five. Hear the BYU group reflect on the experience. Miles Batty led the BYU men's cross country team to a fourth-place finish at the 2011 NCAA Championships—BYU's second-best team finish ever. Two BYU alumni have transformed a tale of tragedy and redemption into a musical, coproduced by BYU and the Scera Center for the Arts. M. Sanjayan, lead scientist of the Nature Conservancy, speaks on the interplay between poverty and conservation. Professor Robert Viscusi of City University of New York traces the history and current status of Italy as a global brand. In this video His Excellency João Vale de Almeida of the European Union shares his take on the fate of the euro. Stream the Kennedy Center's latest Cafe CSE video and get expert insights on the relationship of J.R.R. Tolkien and C.S. Lewis. McKay School professor Melissa Heath says teachers—not just therapists—need the skills to help children in times of crisis. Teacher collaboration has positive effects on students, according to Principals Academy codirector Barry Newbold. Her science fair project testing for life on Mars won big in Utah. Now the Timpview High School senior is winning abroad. The new McKay School alumni website features handy resources for teachers, administrators, parents, grandparents, and current students. Family life professor Dean M. Busby has researched couples across religions. See how LDS couples stand out. Get to know the new dean in the fall issue of the college's alumni magazine, Connections. Worried about privacy when casting your ballot? You're not alone, according to a new BYU study. History professor Jay Buckley was recently elected president of the Lewis and Clark Trail Heritage Foundation. Competing on the fall 2011 season of NBC's The Sing-Off, student Laina Walker stuck to her guns and stayed modest. More than 250 objects of Islamic art—some a millennium old—are on their way to BYU for a landmark exhibit. Upcoming events at the Museum of Art include a party for its newest acquisition: Brian Kershisnik's Nativity. Senegalese author Cheikh Hamidou Kane attended a BYU colloquium honoring his acclaimed novel L'aventure ambiguë. The first BYU team to compete at MIT's iGEM contest won a gold medal for creating E. coli that might detect cancer. Soil scientist and BYU professor Richard Terry has been named a fellow of the American Society of Agronomy. Environmental science major Heather Finch proposes saving ecosystems with the Black Fingers of Death. At Homecoming 2011 honored alum Debra Hobbins urged future nurses to focus their passions, get involved, and embrace life's opportunities. Senior Heidi Newsome recently presented her ORCA-funded research on ways to handle the ethical challenges unique to nursing. Young students from Japan's top academy come to the United States each year—and make a requisite stop at BYU. Chemistry professor James Patterson is using gold-backed mirrors to explore more efficient ways to separate chemicals. See what alum Steven LeBaron said about his experiences as customer engineer on the world's most fuel-efficient airliner. Student Jack Fuller won three years of funding from EnergySolutions to research an alternative neutron transport model. Speaking at BYU, U.S. Court of Appeals judge John M. Rogers outlined three civic obligations of judges. The November 2011 issue of National Jurist ranked BYU Law School second in "Best Value Law Schools." PreLaw Magazine ranked the BYU Law School fourth in externship opportunities. See the rankings. Students and faculty packed the moot courtroom as the Utah Supreme Court held two sessions at the school Nov. 2. A new display honors George E. and Elma Stoddard, generous donors to the Marriott School. In 2012 BYU business students will be offered two new international exchange programs. Find out where. A Marriott School initiative has upped job placement to 91 percent for grad students—despite a struggling economy. Francine Giani, the Utah Department of Commerce's executive director, received a distinguished alumni award. A new five-story building will serve as a gateway to the south end of campus. From tickets to tailgating to the fireside, join us for the Dec. 30 bowl game vs. Tulsa. Alumni recall campus as it was in this video companion to "100 Years on Temple Hill." In a new book, Latter-day Saint scholars discuss criticisms of the Church.